What Next For Bryant Jennings? 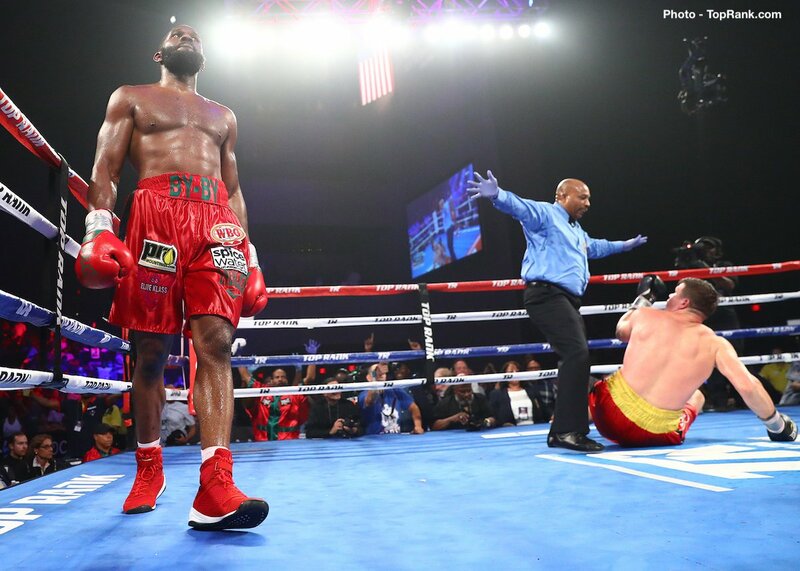 Philadelphia’s Bryant Jennings scored a notable stoppage win over Alexander Dimitrenko last night, getting off the floor to halt the taller, bigger man in the ninth-round. Now winner of five straight since suffering a stoppage loss to Luis Ortiz in December of 2015, the 33 year old may well be on the brink of either a big elimination fight or maybe even another title shot – Jennings, 24-2(14) dropping a competitive decision to Wladimir Klitschko in April of 2015 in his fight prior to the Ortiz defeat. Last night, though he was badly stunned in going down in the fourth-round, Jennings put on a good performance (though for some the stoppage Jennings scored in the ninth was a premature one; Dimitrenko, 41-3(26) calling for a rematch). Speaking with RingTV.com, Jennings said that had he been fighting Ortiz last night, he would have beaten him. With all the current heavyweight title holders busy right now, maybe Jennings and Ortiz could meet again, maybe in an elimination bout. Jennings wants revenge and Ortiz seemingly has no next fight planned right now. It would be a risky match for both, but it would also be a big fight – an exciting fight. Or maybe Jennings will look at getting a shot at newly crowned interim “regular” WBA heavyweight titlist Trevor Bryan. Bryan should keep busy and defend his belt while Manuel Charr, the full “regular” WBA champion defends against Fres Oquendo in September, and maybe a fight with Jennings would work (with Bob Arum and Don King working together for an added twist; they have done so before after all). Jennings is a worthy contender and he remains hungry, as he said both before and after last night’s victory. There are some good possible fights out there for the man known as “By By,” too – against the likes of, maybe, Jarrell Miller (a far better fight than the one Miller is taking next, against Tomasz Adamek), Joe Joyce, Dillian Whyte (who wants to fight again in December) or Ortiz in a return fight. Can Jennings achieve his goal of becoming a word champion before his career is over? You are here: Home / Boxing News / What Next For Bryant Jennings?